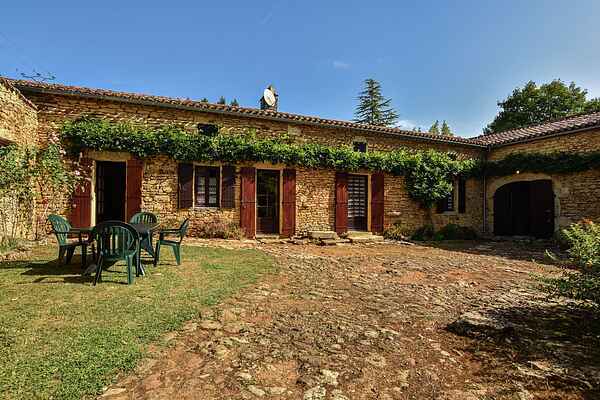 A gorgeous country home awaits you in the Périgord, right near Villefranche-du-Périgord (7 km) and Loubejac (4 km). You can take beautiful walks over the meadows and through the woods surrounding the house and enjoy the peace and privacy. Inside you have an enormous living room with a comfortable sitting area and a fire place. Stairs lead to the upper- and lower floors. The stately country home is situated in a gorgeous environment. The medieval town of Villefranche-du-Périgord is a lovely location to go explore and stroll through the old scenery. You will be amazed! You can of course also enjoy your terrace and enjoy a good glass of wine. In Villefranche you can play tennis or rent a bike to go and explore the area. There are several lakes where you can go for a swim such as (12 km) and Cazals (20 km). They can be reached by car in no time. The children will love a visit to the mighty castle of Biron (27 km), the caves by Eyzies-de-Tayac-Sireuil (44 km) or the water park of Le Bugue (43 km). The town of Cahors (49 km) is also lovely.